I have a treat for you. Flourless Chocolate Cookies. These decadent 4 ingredient flourless chocolate cookies are so amazing. They didn’t even last the day at our house! We ate the entire batch almost immediately. Most flourless cookie recipes call for oats and banana. My flourless cookie recipe has no banana or oats! This recipe makes a small batch and they also freeze well. 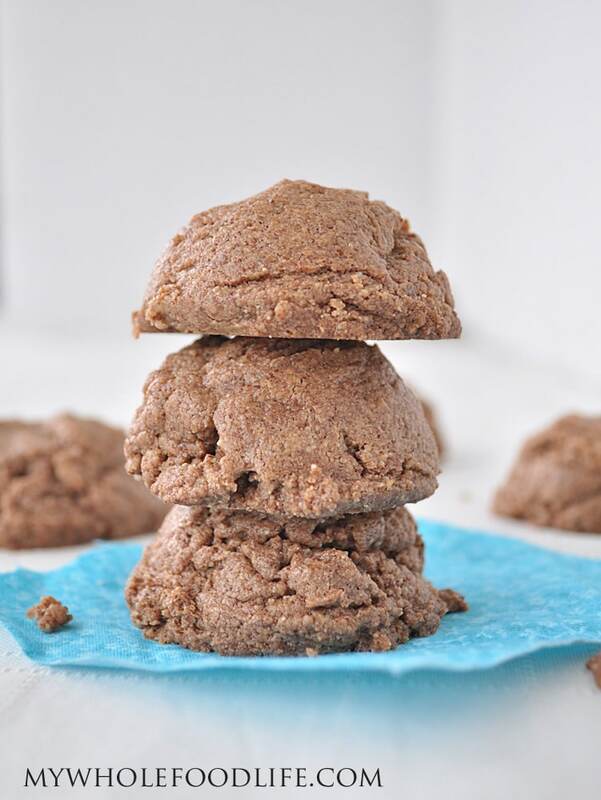 These flourless chocolate cookies are vegan, gluten free and grain free. They could also easily be nut free if you use sunflower butter instead of almond butter. 🙂 If you like this recipe, you may also like my Flourless Zucchini Brownies or my Super Moist Flourless Brownies. The easiest cookie you will ever make. It's healthy too! In a food processor , combine all ingredients. Let completely cool before removing from the cookie sheet. Please make sure the cookies have completely cooled before removing them from the baking sheet. I tried to grab one before they were cooled and it crumbled on me. I didn't have that issue when they had cooled. These cookies should last a couple weeks in the fridge. You can also freeze them for longer storage. Enjoy! Made these a few hours ago and they came out very good. Will make them again they were tasty. I made these today with cashew butter (and double the cocoa) and they are amazing! Thanks for such an easy recipe! Thank you very much. I will cook them this afternoon. I might have to try a round 2 with these. Made them yesterday - consistency was good, but really just tasted like almond butter..and I normally enjoy things a little less sweet, but these turned out pretty bland. I think I'll try again and up the syrup a bit! ;) Thank you for all your awesome ideas - Happy Holidays! Can i use homemade peanut butter and honey instead of maple syrup? Melissa I have made these over and over and love them each and every time. The ones in the oven right now have unsweetened cocoaddednut . Can't wait. Thanks again for your great recipes! You are so welcome Lisa! So glad you liked them! We tried half sunflower butter and half almond butter, turned out great! I had an issue with my food processor not handling the butters well and getting stuck (any suggestions for next time are welcome! ), so ended up mixing it by hand and it worked fine in the end. My kids love them!